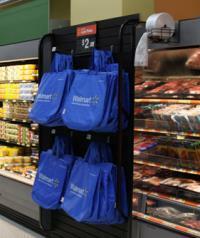 Walmart Stores is now offering a range of reusable bags at checkout counters in an attempt to restrict single-use plastic grocery bags. The company has also committed to reducing plastic and other packaging materials in products marketed with an initial emphasis on Walmart private brands. Their goal is to achieve 100 percent recyclable or compostable material by 2025. Walmart intends to power half of its operations with renewable energy by the end of 2025. The Company has signed contracts for new solar and wind projects intended to supply 214 billion kilowatt hours of renewable energy annually. Walmart will install electric vehicle charging stations at stores, extending the availability beyond the current 29 states. Walmart will require suppliers of clothing and home textiles to conform to the Sustainable Apparel Coalition HIGG Index Facility Environmental Module by 2022. It can be logically expected that Walmart will evaluate sustainability and energy use on farms and packing plants supplying products to the company. Aspects of operations that may be evaluated include insulation on houses, conservation of energy and water, disposal of manure and packaging.